I don’t know about y’all, but bananas are a big deal in our house. The 17-month old seems to like them in his cereal, as a snack, and…well, you get the picture. It is a rare occasion to find bananas “going bad” during the week. And when I say, “going bad,” I mean in the “hurt so good” kind of way because once they are good and brown they are good and ready for some banana bread. And I love banana bread. No need to write an entire post about banana bread because I reckon it is a universal thing (unless you just hate bananas). 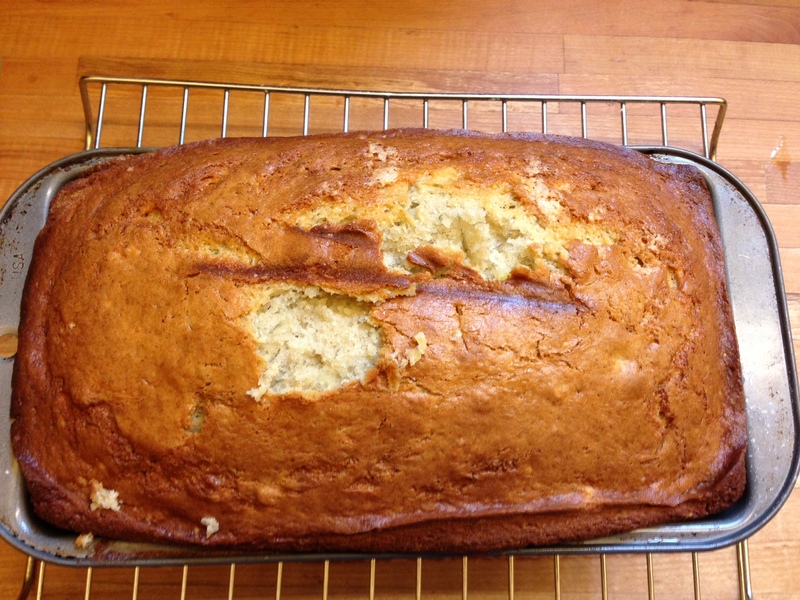 This time I made Cooking Light magazine’s Classic Banana Bread. We’ve been snacking on it all weekend. Since I followed the recipe verbatim, I’ll just link you to the recipe on MyRecipes.com. Only caveats? 1) I may add some walnuts next time as I missed the crunch. 2) Re: photo above…Be sure to go ahead and put the loaf pan on the upper rack in the oven to cook. (In other words, this loaf rises.) Oooooops.